Prisoners from across Nazi-occupied Europe were forcibly deported to Auschwitz in nightmarish conditions: crammed into freight cars, with no water or food, traveling for days on a journey that sometimes proved deadly. In many cases, the people suffering this journey had already been subjected to other cruelties including inhumane imprisonment in ghettos, legal and social marginalization, humiliation and degradation, and grueling years of internment in other concentration or forced labor camps. Then they arrived at the long platform known as The Ramp (Die Rampe). At the end of The Ramp stood several SS doctors who—in mere seconds—decided the fates of the prisoners who came before them. Sometimes they delivered immediate life-or-death verdicts; other times, they questioned prisoners about age, occupation, and health. A transport deposits prisoners on the Ramp. 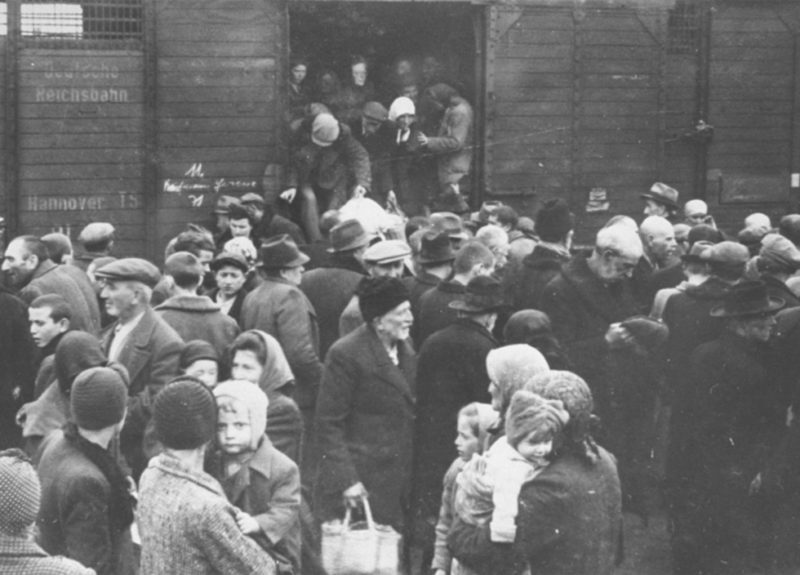 The railroad car (“Deutsche Reichsbahn”—“German State Railway” is visible on its side) had no steps, so here we see older Jews being assisted in disembarking. © Yad Vashem. If an SS doctor pointed to one side, the person whose life was in question joined those who were fit for work. If he pointed to the other side, it meant immediate execution. Approximately 75-80% of people who were deported to Auschwitz were sent to the gas chambers in the first selection, as soon as they arrived. Children and the elderly were often automatically deemed unfit for forced labor and sent to the gas chambers. The same was often true of mothers with small children and people who were considered weak or sickly. Selection also determined which people would be tortured and killed as “test subjects” in pseudo-scientific experiments. During the selection process, prisoners were forced to surrender to the SS the few belongings they carried. Their baggage was piled on the platform to be subsequently sent to Germany and sold there. Those who were deemed fit for work were “sanitized” and sent directly to a section known as the Sauna, where they were disinfected, shaved, and stripped of their clothing and valuables. Here, they were given a camp uniform and tattooed with a number to replace their name. The ink tattoos on the arms of prisoners remain strong symbols of the Nazi agenda to dehumanize and degrade human beings. After the Sauna, the SS transported people to the quarantine zone, where they experienced arbitrary punishments and a humiliating lack of privacy, and were denied medical treatment even if acutely ill.
During their stay in Auschwitz, prisoners received only one ragged uniform and a pair of shoes or crude, uncomfortable clogs that caused serious sores and illness. They were made to wear the same uniform—frequently lice-ridden—to work during the day and to sleep at night. Poor attire, overcrowding, and persistent starvation caused the rampant spread of contagious disease. Inmates trapped in unhealthy living conditions and assigned to scarcely ventilated barracks were in no position to battle illness. The barracks were barely insulated from the cold—a deadly problem during harsh winters of Oświęcim. Rather than a bathroom, there was one bucket per the hundreds of inhabitants of each block. In Auschwitz, as in all of the concentration and extermination camps in Nazi-occupied territories, hunger was chronic and ubiquitous. It was the number one reason that prisoners of Auschwitz had an average life expectancy of a few weeks or months from the time of their arrival at the camp. Though the Nazis claimed to have an official, balanced menu for prisoners, they in fact distributed subpar food in insufficient quantities. The daily ration usually consisted of a bowl of a bitter beverage (substituting for coffee) for breakfast, a dish of thin soup made from rotten vegetables or meat at midday, and a crust of bread and a small portion of margarine before bed. Starvation was a persistent threat, and claimed the lives of many inmates. All experienced extreme hunger, often accompanied by crippling abdominal pain, diarrhea, and other physical and psychological effects. SS officers and guards frequently and arbitrarily punished inmates by depriving them of food altogether. The gate to Auschwitz bears a now-widely familiar inscription: Arbeit macht frei, or “Work will set you free.” Prisoners at Auschwitz were essentially forced to provide slave labor in the service of the Third Reich. People were forced to work at a frenzied pace for more than 11 hours at time with barely any rest or tools. They performed a range of demanding tasks including loading heavy materials; mining; sorting the belongings that had been robbed from people upon their arrival at Auschwitz; producing chemicals, weapons, and fuel; and building infrastructures. Other forced labor was mandated in the direct of service of the Nazis’ genocidal ambition. To hide the evidence of their massacres, after the SS had gassed people with Zyklon B, they made their own prisoners (assigned to the Sonderkommandos and the crematoria) burn the bodies of hundreds of thousands of their fellow inmates, some of whom they recognized as family members, friends, or acquaintances. The goals of hard labor were the extermination of Jewish people and others whom the Nazis targeted, and the support of the Third Reich’s war effort. As World War II wore on, the SS arranged to “rent” the labor of people interned in Auschwitz to private companies. These companies paid a nominal fee to the Third Reich in exchange for what was essentially a slave labor force. Prisoners who were made to work in the service of this project were mistreated and physically, mentally, and emotionally abused. They were exploited without reprieve or protection. Deaths resulting from extreme fatigue or work accidents were commonplace. As deportatons to Auschwitz continued, “replacement” workers poured into the camp. Gruesome and unimaginably cruel pseudo-scientific medical experiments were conducted on inmates of Auschwitz. Prominent Nazi doctors including Josef Mengele, Horst Schumann, and Carl Clauberg subjected thousands of people to painful, horrific, and deadly experiments. As Nazi ideology considered these “test subjects” inhuman, they were exempt from ethical concern. Jews undergoing the selection process at Auschwitz. The woman in the forefront is Geza Lajtos of Budapest. Behind her, an SS physician “examines” a Jewish man. © Yad Vashem. “Kanada” prisoners sort clothes taken from new arrivals to pack and send to the German Reich. Most of the owners of these clothes would be killed within 24 hours. © Yad Vashem. A woman walks with children toward the gas chambers. © Yad Vashem. Jewish women, newly registered in Auschwitz. They were forced to wear this uniform night and day for the rest of their time in the camp. © Yad Vashem. Jewish men, newly registered in Auschwitz. They were forced to wear this uniform night and day for the rest of their time in the camp. © Yad Vashem. Barracks in the Auschwitz II-Birkenau death camp, as they appear today. © Paweł Sawicki. Up to six people slept in each of the beds that made up the 36 bunks in a barrack. Courtesy of National Archives and Records Administration. Prisoners held in the Nazi German camp of Mauthausen. Extreme—often deadly—malnutrition was the standard in all concentration camps. Courtesy of National Archives and Records Administration. Uniform worn by Marian Kostuch, held as a Polish political prisoner. Kostuch was born on June 8, 1922, in Bieżanów. His occupation was listed in camp records as “tanner.” © Paweł Sawicki. Entrance to Auschwitz II-Birkenau, as it appears today. © Paweł Sawicki. Drawing by David Olère, a Polish Jew who survived Auschwitz. © Ghetto Fighters’ House Museum. In Auschwitz, a bowl could mean the difference between life and death. Without one, it was impossible to receive even the minimum ration. © Paweł Sawicki. Inmates building the Krupp factory in Auschwitz, 1921-43. Companies including IG Farben, IBM, and Siemens profited from the slave labor in Auschwitz. Courtesy of National Archives and Records Administration.